This is the latest publication in a new series of literary city travel guides. It is a wide-ranging guide divided into themed sections including excerpts from fiction, memoir and travel writing. 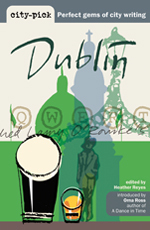 We can compare Thackeray’s Dublin of 1843 with Chris Binchy’s Dublin of the twenty first century. 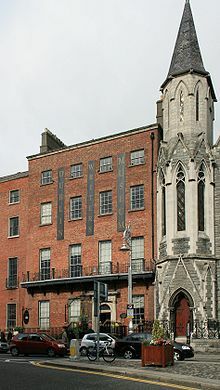 There are sections on Dublin’s streets and buildings, Dubliners themselves and the history of the city. You could probably guess what the section entitled ‘Publin’ is about and of course, you could not have a portrait of the fair city without mentioning pubs and their place in popular culture. Anyway as Michael Cronin so rightly remarks, directions to foreigners often use pubs as landmarks. The section called ‘The good, the bad and the (just a little bit) ugly’ deals with a few of the contrasting aspects of the city. Some authors look at the seamier side of the city and poke at the underbelly of the fine Georgian buildings and elegant squares. Writers have looked at the poverty in the city of the past, pre-Celtic Tiger prosperity. There are also reminders of a time not so long ago, when you would be hard pressed to find a delicatessen and Friday’s fare was fish. The final section, ‘All in the past’ covers in just a few extracts some of the critical periods in Dublin’s recent history, from a snapshot by Edward Rutherford of Dublin under the Protestant Ascendancy to the 1916 Easter Rising as described by Kathleen Clarke, the first woman Lord Mayor of Dublin. I have been living in Dublin for around six years and so have a reasonable working knowledge of the city, but I found it fascinating to read snippets of the life and history of Dublin from differing viewpoints. For me though, part of the attraction is in finding familiar street names and locations in some of the accounts. I almost feel like a real Dub. This book is excellent for the armchair traveller as well as the literary tourist. I think it probably works best to dip in and out of the text. To read straight through would be too much like doing literature homework. You would be expecting to have to do a comprehension exercise afterwards. Zipping from one decade and one writer to another as the fancy takes you is the best way to appreciate the literary nuggets this book has to offer. Full details of the original publication of the extracts are at the back of the guide so it is easy to follow up anything of particular interest. I started reading this guide a few days after finally making it to the Dublin Writer’s Museum in Parnell Square. The museum is well worth a visit, particularly if you have this anthology for company. I had some of the images from the museum floating round in my head as I leafed through the list of authors included in the guide. Some writers come under the heading of ‘the obvious suspects’ such as Beckett, Behan and O’Casey but there are also contemporary writers such as Anne Enright, Roddy Doyle and Joseph O‘Connor. However, as Orna Ross points out in her introduction, Dublin’s relationship with its writers has often been a vexed one. She bluntly says ‘Dublin used to like its writers dead. For the first fifty years of the Irish state, any living author who wrote a worthwhile word was censored and, often, hounded out’. Dublin is also seen through the eyes of its visitors. I have already mentioned Thackeray, but Eric Newby, V.S. Pritchett and Heinrich Böll have also stayed and observed. One of my favourite topics covered in the book is that well-known Dubliner James Joyce, who not surprisingly pops up in more than one extract. I am not quite a Joycean virgin since I have at least read The Dubliners but that is as far as I have gone yet. One day I may even venture to unlock the mysteries of Ulysses. I am undecided about the merits of the Bloomsday activities entertainingly reported here by Brian Lalor, but I am probably going to come down on the side of the enthusiasts. It is just another form of book group after all, only with dressing up and Guinness to add to the literary pleasures. All good, clean fun. 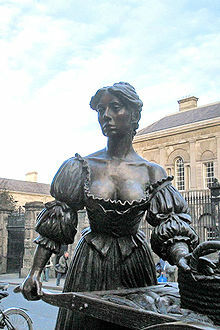 And in another piece I loved the description of Molly Malone’s breasts as ‘a brace of butternut squash’. I shall never look at the poor woman in the same way again. In our house she has always been known as ‘the lady with the baskets’ thanks to our young daughter, but now I can’t get butternut squashes out of my head thanks to Neil Hegarty. Despite being left with this unfortunate mental image, the guide is well worth reading, even if you are not planning a trip to Dublin in the near future. In fact, I might yet work my way through the whole series. Armchair travelling at its best.